Posted byMahdi February 11, 2017 21 Comments on removing wordpress malware infecting js files. This will remove the pattern from each single file that contains it. It is really very helpful to remove malware. But I have tried below command it is not removing from the js only changed the file modified date. I think sed command not recognize the backslash ( \ ). Please help me to run this command. what is your output when you run sed? I was able to clean the files using the command i posted in the tutorial. I also have the issue. I make the php file in the public html , but cant use it and dont know how to run. no where in this blog post was mentioned about a php file. So how to run that commands in public html ? Hi have the below code in all the .js files. Please share the exact query which needs to be executed. Nope. Not able to remove it using your script. you may need to modify this solution to suite your case. question. how can I find the db.php file and avoid to create it again? what if we just replace or remove the ‘var _0xaae8’ rather than the entire code .. that should disable the code .. isnt it? I want to know what the code means. Is there any online service to decode it? 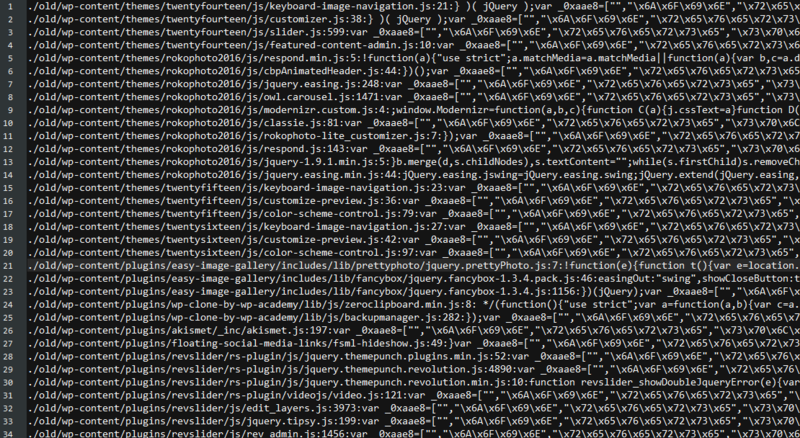 This malware hacks your server and replace all the js for all the projects on server. You cannot remove this by just find and replace. Please search for the concrete solution. I have replaced all my projects and their js by backup but the problem still persists. There is a replace script on server that we all should find and kill. I got source of this malicious activity in 404.php of current theme. RESOLVED for me. the injection can be in different file in different case. hopefully my tutorial can give some overall insights on what causes the problem and how to solve it.